Some images and specs have popped up of a Nokia device, bound for China with a dual-mode quad-band GSM and TD-SCDMA network - codenamed 801T. In the specs sheet that was uncovered it says it uses the Symbian^3 (which is old news now) and not WP7. It could be Anna or Belle. The screen will have an nHD resolution and will measure about 4.3", the camera is an 8 MP unit and there are no visible buttons on the front. There's no word on the processor but the quoted RAM is 256MB, which doesn't exactly scream high end these days. And it's a hefty device at 171 g.
Being dual-mode GSM and TD-SCDMA device, the 801T will be able to operate globally on most networks. Here's the full specs sheet. Thanks, aikon171 and Sushant Virdi! 100% old prototype because it uses old chipset with ARM926 processor up to 416MHz, so basiclly it is something old or with symbian^2. 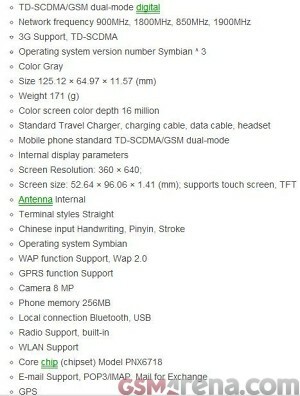 Maybe this is the Chinese version of the Nokia N8's successor, because its a "T". Like Nokia T7 was a downgrade to N8, 801t is a downgrade to 801.